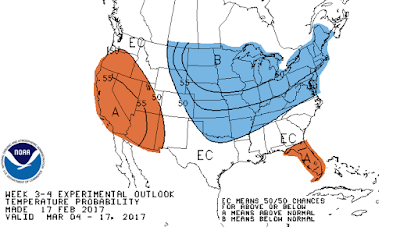 As we close out what will likely be the warmest February on record, March appears to be coming in like a lion as severe weather potential exists mainly early on Wednesday morning (March 1). The severe weather outlook for Tuesday through 6am Wednesday. A Slight Risk (category 2 of 5) is in effect for the metro, primarily for the last few hour of this outlook period (wee hours Wednesday). 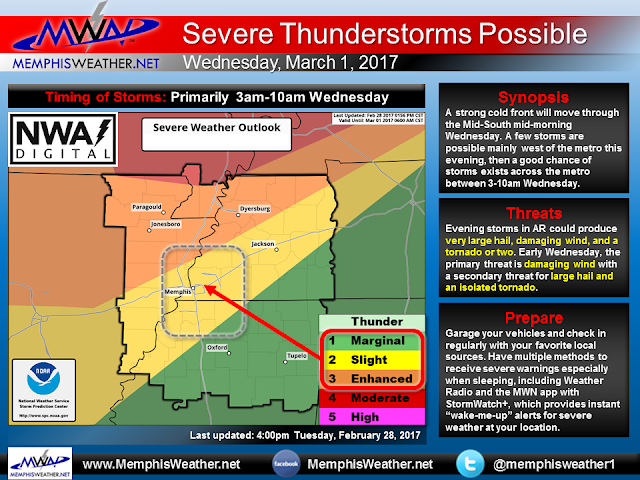 The severe weather outlook for Wednesday, beginning at 6am. A Slight Risk (category 2 of 5) is in effect for the early portion of this outlook period. Storms should be east of the metro by 9-10am. For the Memphis metro, most of the "discrete" supercells tonight will remain to our north. That is a good thing. A few thunderstorms will likely form in AR late this afternoon/early evening and move northeast, but will likely miss the metro to our northwest. We'll be keeping a close eye on this situation as they could produce large hail, damaging wind, and have the low potential for a tornado. Note that those are most likely in the Enhanced Risk (3 of 5). For at least the first half of the overnight period, we should remain dry, but strong south wind and high dewpoints (mid 60s) will keep the pump primed. 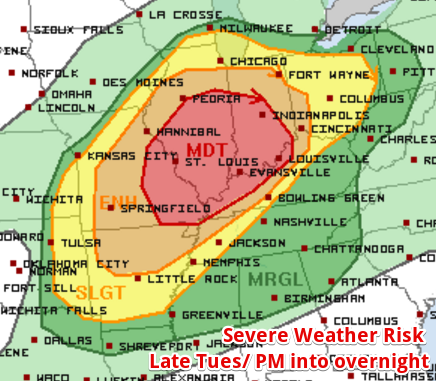 By the wee hours of the morning through rush hour, we will begin to see our severe weather risk ramp up as the cold front draws a little closer to our area. 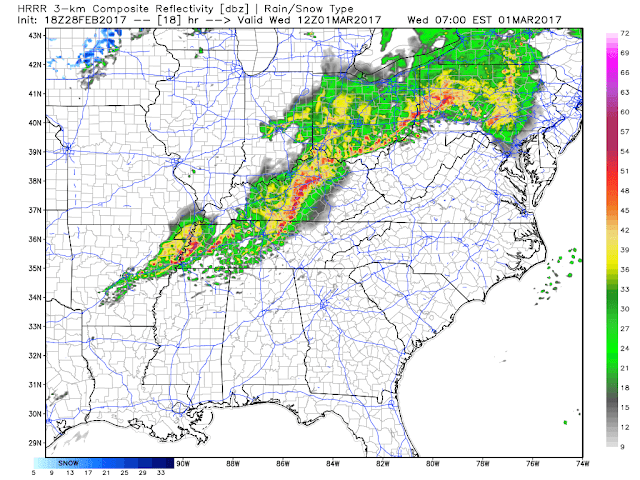 The possibility exists of one or more lines of strong to severe storms moving through between 3am-9am. These lines would bring the possibility of straight-line wind damage, perhaps some hail, and a low-end tornado risk. By mid-morning, the line(s) should be to our east and the threat of storms ends as wind shifts to the northwest and temperatures fall out of the 70° range. To summarize, a few storms are possible, mainly northwest of the metro, early this evening, followed by a higher risk of storms from the wee hours of Wednesday morning until mid-morning. Damaging wind, hail, and possibly a tornado are all possible. We strongly suggest that you take the time review your severe weather action plan and make sure that you have multiple ways to receive notice of threatening weather while sleeping. 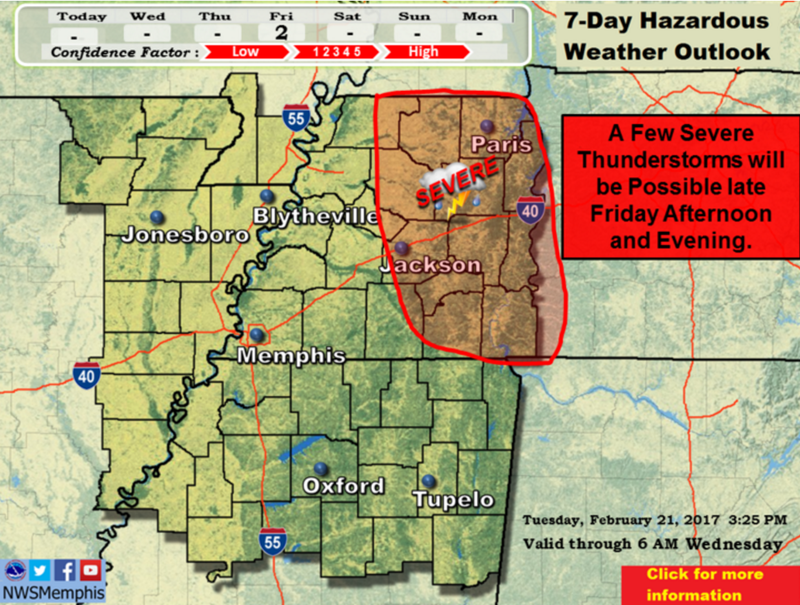 These could include NOAA Weather Radio and a smartphone service like StormWatch+ in the MemphisWeather.net mobile app. Do NOT rely on hearing a tornado siren overnight. With wind blowing and potentially rain hitting the roof, you're asking for trouble if you hope that you hear a siren. We also encourage you to follow along on our social media channels for the latest information and nowcasting of any storms that affect the area. Given that this week is also Severe Weather Awareness Week, it's perhaps ironic that severe storms could occur. 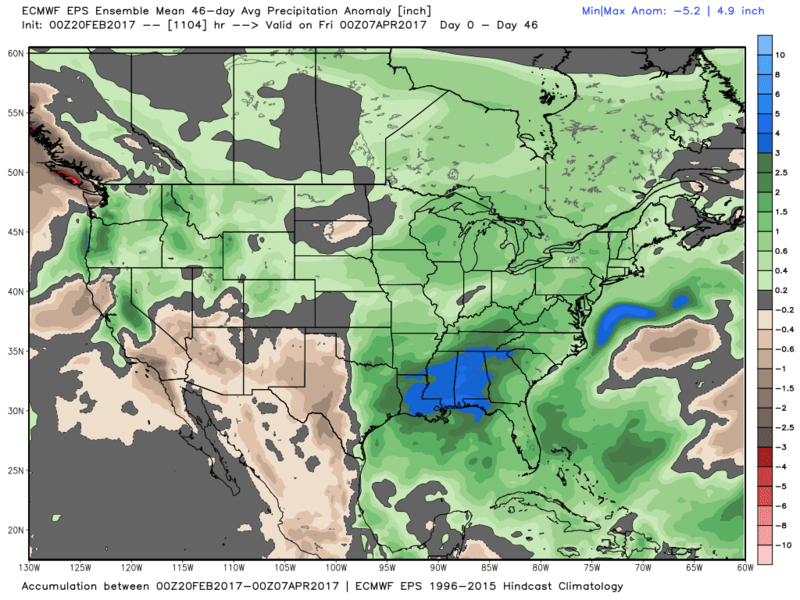 However, it's also fortunate that this week is the one week of the year that we discount the StormWatch+ service in the MWN app! If you don't have a weather radio or can't get one, spend $5.99 (one-time upgrade in the app) and set up the locations you want to be alerted for. Here's a video that describes the setup (it's pretty straight-forward) and here's something you should read to make sure you receive severe weather notifications via our "wake-me-up" audio alerts while sleeping. The app only yells at you if a Tornado Warning (or Severe Thunderstorm Warning) is issued for your specific location. Finally, on our Facebook page, we are giving away a NOAA Weather Radio this week courtesy of our partners at Midland Radio! Just find the pinned post at the top of the page to enter. #TeamMWN also will be presenting a severe weather preparedness video discussion on Thursday night at 8pm. Be sure to mark your calendar to watch, learn, and join in the conversation, as well as have another chance to win a weather radio! 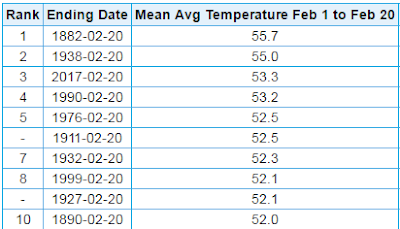 With four days left in the month, February is currently ranked as the warmest on record in Memphis (55.1°, which is a full 10° above the monthly average). 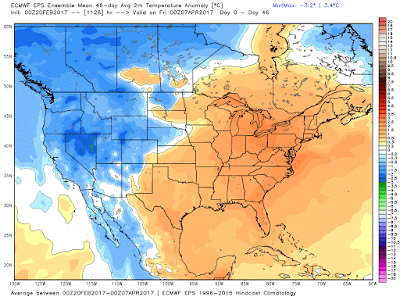 Despite much cooler weather this weekend, we are projecting that the month will end as the warmest since records began in 1875, as the unusual warmth returns to end the month. 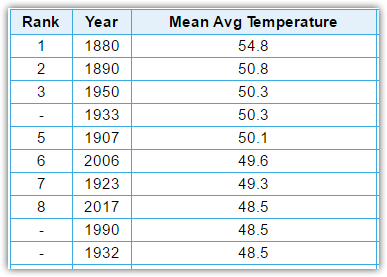 We should also end "meteorological winter" (December-February) with as fourth warmest on record. 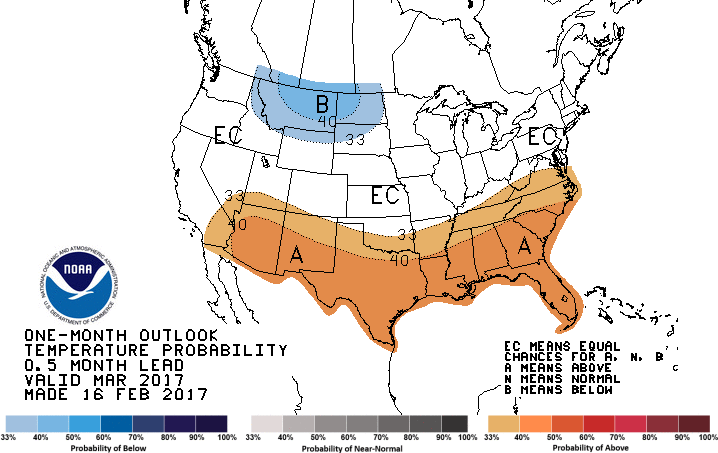 Looking ahead to this week, it also appears that March will come in like a lion! Let's get into the details. 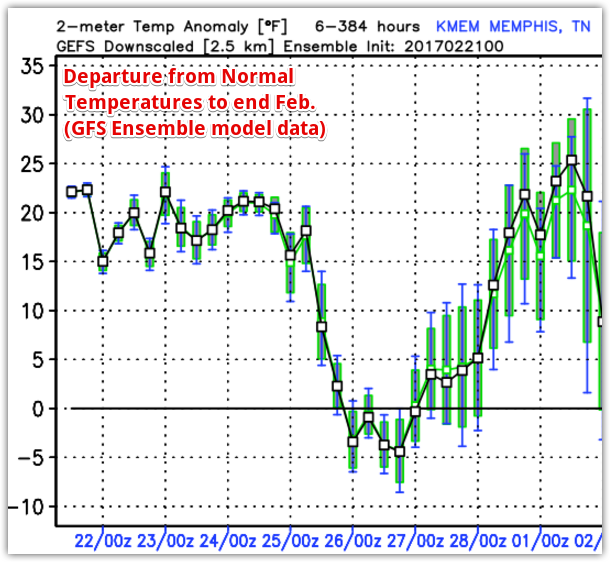 Memphis average temperatures by month for "meteorological winter," ordered by warmest season. This winter currently ranks #4. A strong cold front that brought scattered severe storms to places that don't usually receive them in the winter (Upper Ohio Valley) also moved through the Memphis metro last evening. Though very little rain fell in the metro, it did usher in MUCH cooler temperatures. Most of us woke up to wind chills in the mid 20s with temperatures in the mid 30s this morning. As high pressure moves directly overhead later today, wind dies down and temperatures remain cool despite sunny skies. We'll see highs near 50. With light wind, clear sky, and dry air in place tonight, expect the budded trees and flowers to shiver as the mercury falls below the freezing point - to near 30 in the city and mid to upper 20s in rural and suburban areas. If you need to cover plants to protect them, do so this evening. Outlying areas could see 6-8 hours of sub-freezing temperatures overnight! Sunday begins the warm-up as high pressure shifts east. For the most part, it will be a sunny day with high clouds moving in by sunset in advance of the next quickly-moving weather system. Look for highs about 10° warmer than today, or near 60°. The month of February has also been dry with officially just over an inch of rain so far. That will change as the next weather-system arrives Sunday night. Low pressure organizes in the southern plains and a warm front approaches from the south. 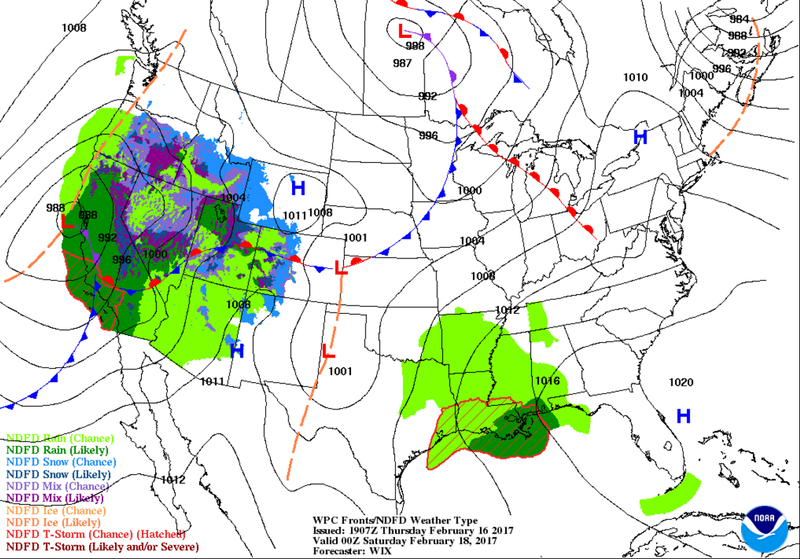 Upper level low pressure will trigger a rain event Sunday night into Monday morning with some rain potentially heavy early Monday morning. No thunder is anticipated from this event, which will move out during the morning hours Monday. Anticipate a wet morning commute. Monday night, the warm front moves through from south to north, ushering in very humid Gulf air and triggering scattered showers and a few thunderstorms. This puts the Mid-South in the warm sector of the next low pressure and frontal system. Tuesday will see very warm conditions and unstable air, but with little dynamics to trigger precipitation, only a few showers or thunderstorms are anticipated, and it could turn out dry. Highs will be back into the 70s with dewpoints near or above 60° and warm south wind. Tuesday night into Wednesday morning, as March arrives, is when we'll feel the effects of that next front. It's too early to predict severe weather chances, but the front will be strong with decent upper level dynamics and will tap into plenty of moisture. 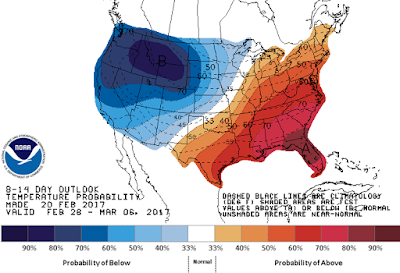 The X-factor could be instability, which would peak during the warmest part of the day. 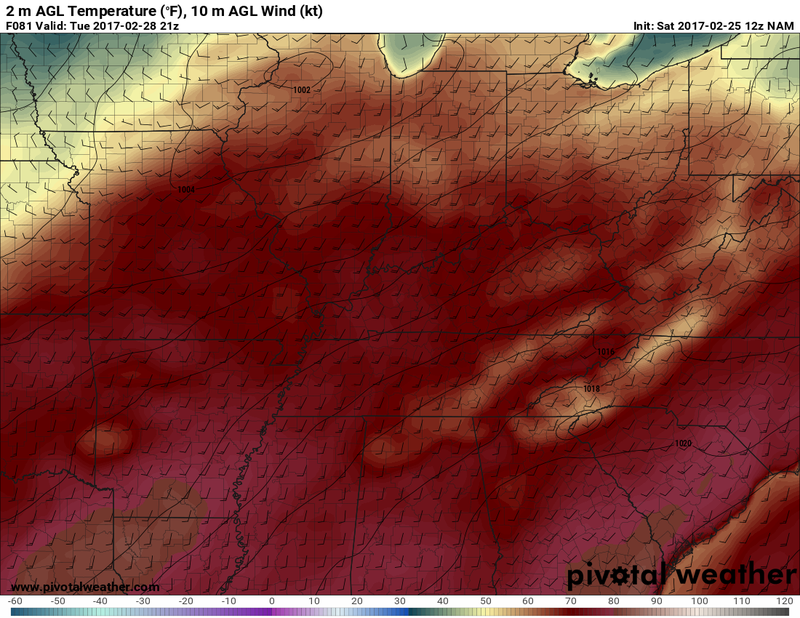 If the front arrives as scheduled now (mid-day), sufficient instability will be a question mark. 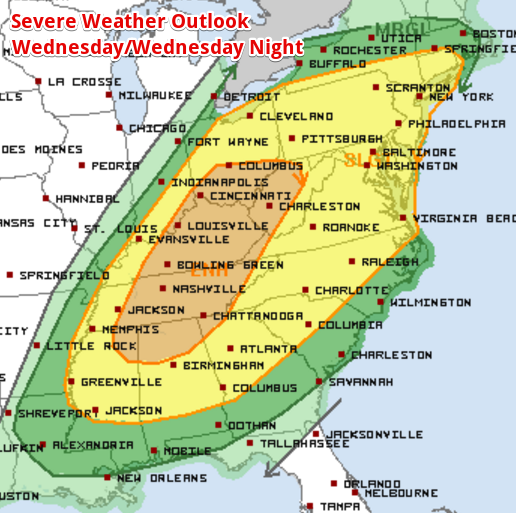 For now, plan on a stormy day Wednesday, particularly early. Behind the front, temperatures cool down again, but sunny skies prevail for the remainder of the week. Next week is also Severe Weather Awareness Week in TN and AR (this past week was awareness week in MS). As usual, we plan to have a full slate of information and education to help prepare you for severe weather season. In addition, we'll have some giveaways throughout the week, including free MWN apps (including our StormWatch+ severe weather alert app upgrade) and free weather radios from our severe weather awareness week partner, Midland Radio! The week starts tomorrow with a discussion of SKYWARN and social media storm spotting and reporting and continues each day with a different topic. We also will be hosting a live video presentation (most likely Tuesday evening, weather-dependent!) with a panel discussion on multiple severe weather topics and a chance for you to ask questions. 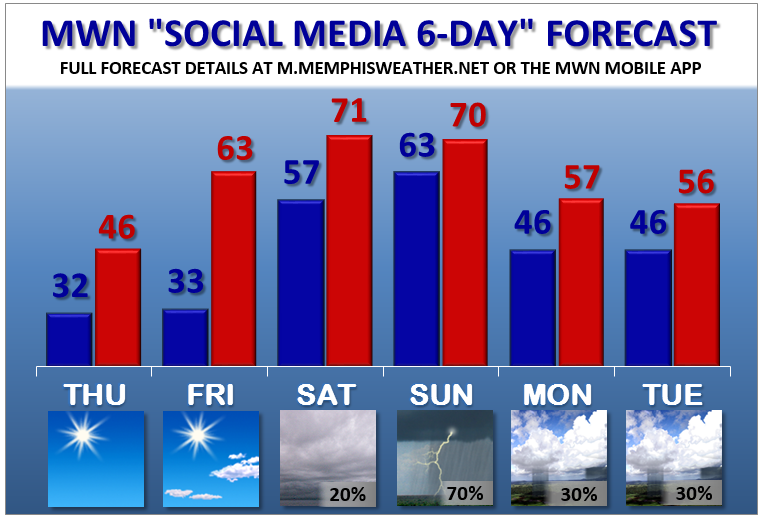 You can get all the details of our activities this week on our Severe Weather Awareness page on MWN. As the close of February draws near, Mother Nature is ready to turn the page from winter to spring. After near record warmth across the region to start the week, the end of this week could bring more of the same, with the possibility of some storms mixed in too. After showers moved through the metro area early on Tuesday, warm temps are coming back for the mid-week. Expect a mostly cloudy sky and highs in the 70s for Wednesday and more of the same for Thursday with a bit more sun. Highs could even reach record warmth by Thursday afternoon. Lows will drop into the 50s to near 60 each night. The final day of this 70-degree streak comes on Friday, but with that comes the potential for some stormy weather on Friday evening in the region. A low-pressure system working its way into the intermountain west will continue to propagate east, bringing showers and storms to the Ohio Valley and Midwest. This system could also bring rain and thunderstorms into our area on Friday afternoon or evening, but right now there is only a slight (20 percent) chance. 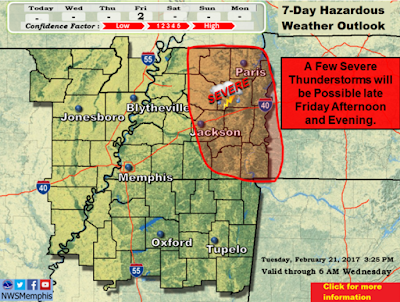 With the cold front set to cross over Memphis to start the weekend, there is the possibility of severe weather across areas north and east of Memphis, although these chances are conditional, meaning that if a few storms can form, they could become severe. Following that front will be a cool down to seasonal temperatures and conditions for the rest of the weekend, though Saturday could be slightly below average. Highs may only hit the mid-50s, with lows in the lower 40s on Saturday. Sunday looks to gradually warm things up a little more, with highs near 60, after a chilly night with overnight lows in the mid 30s. The final few days of February bring temps back into the 60s and 70s during the day, but also another chance of showers and thunderstorms Monday into Tuesday. 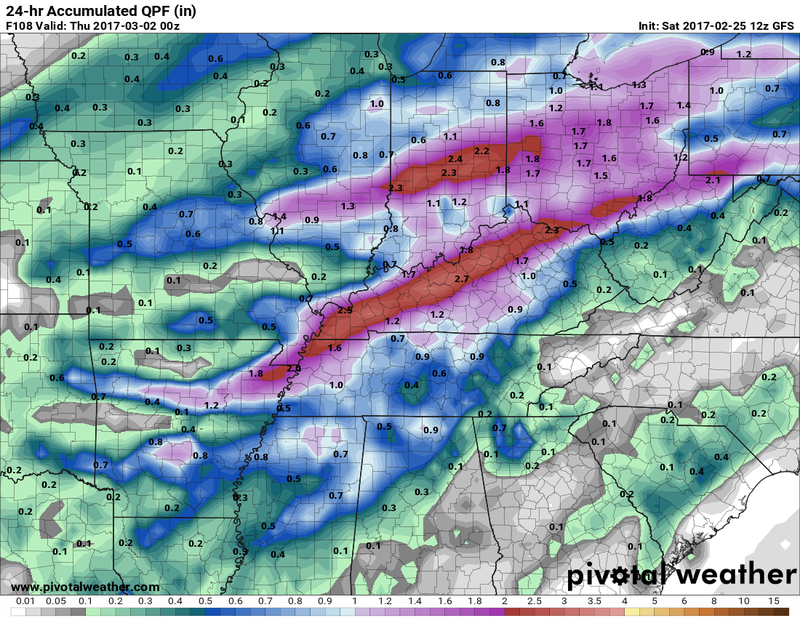 We'll know more after the frontal passage on Friday. Early March is shaping up to be coming in like a lion, with above average temperatures, but also above average precipitation. Perhaps it will help the end of March head out like a lamb? With Severe Weather Preparedness Week underway in Mississippi, and the next week here in Tennessee, now is a great time to get ready for spring storms. Make sure you have warnings pushed to your phone through our StormWatch+ app, where you can customize the alerts you get for your hometown. Also be sure to regularly check our MWN human-powered forecast through our website, social media feeds, and mobile app. The wireless industry, Federal Communications Commission (FCC), and Federal Emergency Management Agency (FEMA) now disseminate Wireless Emergency Alerts (WEA) to cell phone users across the nation. The National Weather Service (NWS) utilizes WEA to push select extreme weather bulletins using this platform. WEA, also known as Commercial Mobile Alert System (CMAS) or Personal Localized Alerting Network (PLAN), is a national emergency alert system to send concise, text-like messages to users’ WEA-capable mobile devices. Along with severe weather alerts, other messages that will be sent as Imminent Threat Alerts include natural disaster notices, such as in the event of an earthquake. In addition to Imminent Threat Alerts, AMBER Alerts will be sent via WEA, as well as Presidential Alerts. 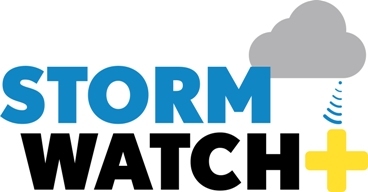 While this sounds like a direct (and free) competitor to Cirrus Weather Solutions StormWatch+ service, StormWatch+ actually has several distinct and important advantages over the WEA system. These are outlined below. Is it spring, winter, summer, or fall? 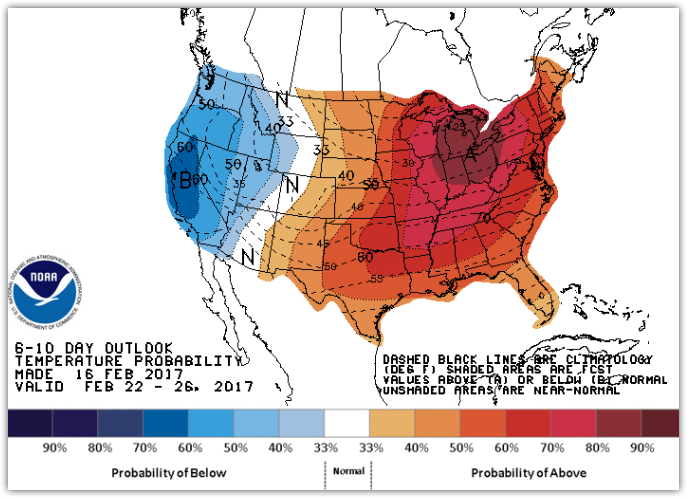 While Mother Nature may still be undecided on the answer to that, the next week will feel more like early April than mid-February. That’s right, the warm weather is back and is shaping up to bring you a pretty good weekend in the metro. 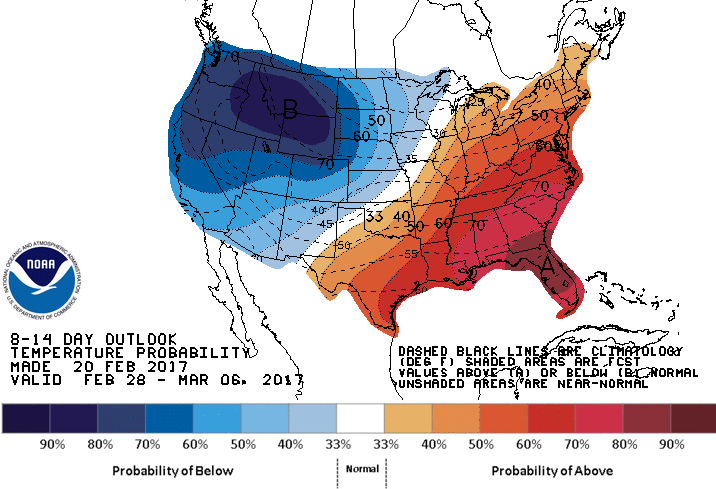 The warming trend that started on Thursday will continue Friday as a ridge over the center of the country builds east. High pressure will remain over the region to end your work week, with temperatures jumping into the mid to upper 60s. Sunny skies will make Friday a pleasant way to lead into the weekend. A south to southwest wind will help usher in that warmer air too, leading to a more temperate overnight low in the 50s on Friday night. By comparison, our average high for this time in February is the mid 50s. The next chance of rain enters the picture Friday night into Saturday. A low pressure system moving across the Gulf of Mexico will throw the chance of showers north into the Mid-South overnight Friday night, though mostly scattered in nature. It will certainly not be a total washout on Saturday, with the best chance of showers coming between midnight and noon. Temps will still stay warm in the mid 60s. Showers and rain will be more likely the further you head south. If you’re traveling down through the Magnolia State, you could see a few thunderstorms too. These storms will likely not be severe across most of the state, though the Mississippi coast could see some stronger ones. Overall, Saturday will be the only questionable day weather-wise over the holiday weekend ahead. Sunday will see clearing skies and warmer temperatures. 70+ degrees would not be a surprise over most of the metro area, with lows in the 50s. For those of you with extended weekends thanks to the Presidents Day holiday, Monday may be the best day of your weekend. Sunny skies and temperatures into the lower 70s will make you want to be outside soaking up some unseasonably warm rays. Lows in the 50s won’t feel bad either on Monday night. 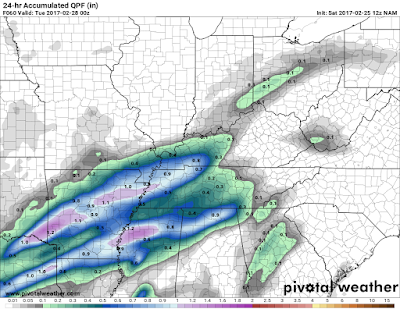 The next system worth watching enters the picture for Memphis around mid-week. A low pressure center currently off the California coast will work its way across the west this weekend, and could bring rain and thunderstorms into the Mid-South by late Tuesday or Wednesday. 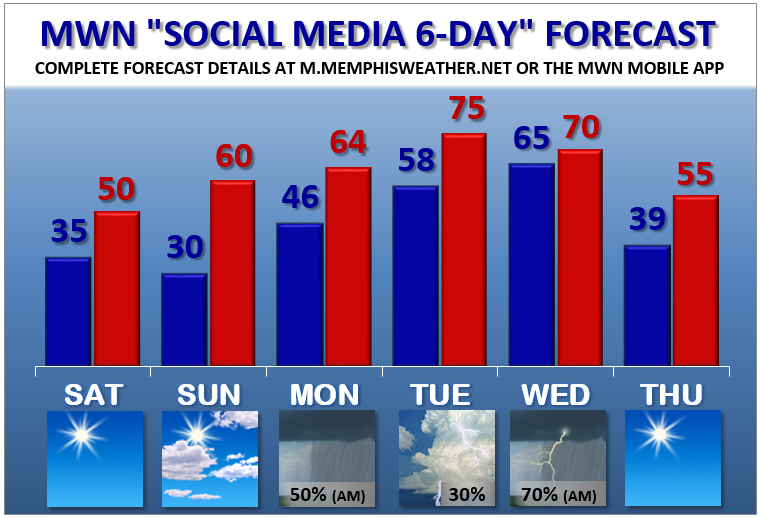 Of course, MWN will keep you ahead of any incoming storms all through the next week. 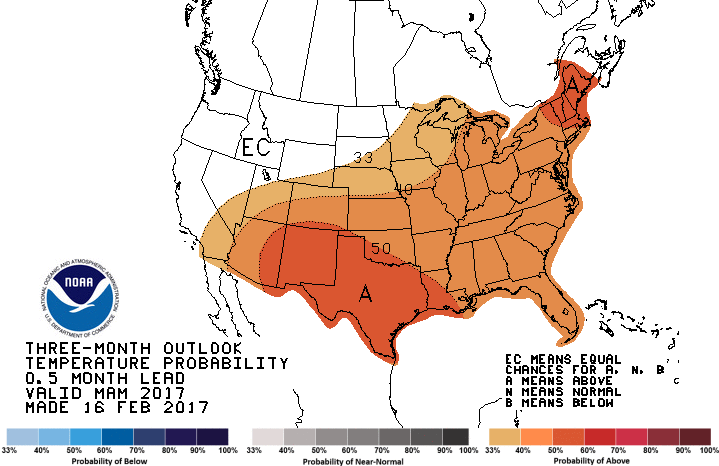 Looking further ahead, the temperature outlook indicates a very high likelihood of above average temperatures continuing into the last weekend of February. Want to get more updates from MWN? Check out our human-powered forecast and don’t forget to download the MWN app for your smartphone and tablet to get your daily dose of MWN in one complete package! Quickie blog today, mainly to pass on our "Social Media 6-Day" forecast to you. It's a continuation of the roller coaster ride we've been on lately! A cold front stalled over the area last night. As it pulled back to the north this morning right around sunrise, dense fog formed. it honestly was some of the "pea soup-iest" I had seen in a long time! As I sat at the intersection of Winchester and Plough Boulevard on the northwest corner of the airport about 8:15am, I couldn't see the control tower. And not just the top of it, which happens sometimes, but NONE of it! And yet, there was FedEx, landing planes anyway! I marvel at how those jets and their flight crews can operate in such harrowing circumstances as not seeing the runway until you're over it. The fog lifted by mid-morning and this afternoon, that front got one more push south, shifting wind back to the north, starting a temperature drop that will continue until tomorrow morning, when it will end up about 40° cooler than this afternoon's high just above 70° with wind chills down in the 20s. If you're heading out this evening, take a coat. Temperatures will be in the 40s with a gusty north wind up to 25-30 mph. Tomorrow we're back to winter. Sun returns, but the mercury tops out in the mid 40s. A clear night is expected Thursday night with lows near freezing. As wind begins to shift towards the south Thursday night, it picks up Friday, pushing temperatures BACK into the 60s! South wind taps into some Gulf moisture Saturday with highs back above 70°, despite abundant cloud cover and widely scattered light showers or sprinkles dotting the radar. After December broke a streak of six consecutive months ranked in the top 10 warmest for their respective months, January returned to the top 10 rankings, tied for eighth warmest January on record. The warmth lasted nearly all month with just one spell of multiple days that were well below average temperature-wise, which also coincided with the first significant snowfall of 2016-2017 winter on the 6th. That early-month cold spell featured four consecutive days with high temperatures at or below 35 degrees and a couple of morning lows in the lower teens. 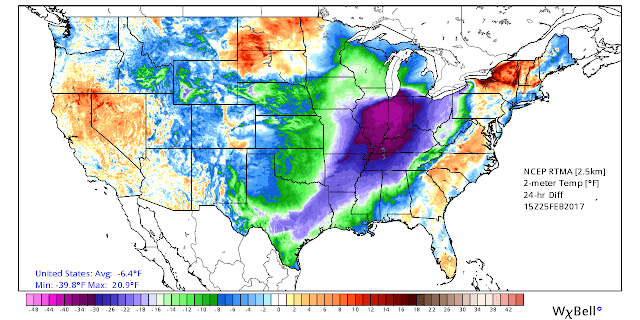 However, three days later, highs were back above 70 degrees. After the 9th, only two days featured average temperatures below normal, and those were 1-2 degrees below an "average" day. 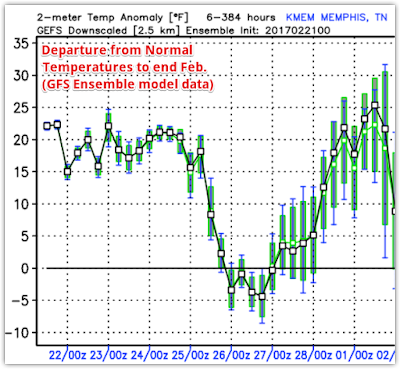 Warmest Januarys on record in Memphis, per the National Weather Service. 2017 tied for 8th warmest. Precipitation was just a bit above normal at the airport, but below average at MWN in Bartlett with more than an inch and a half less than the airport recorded. 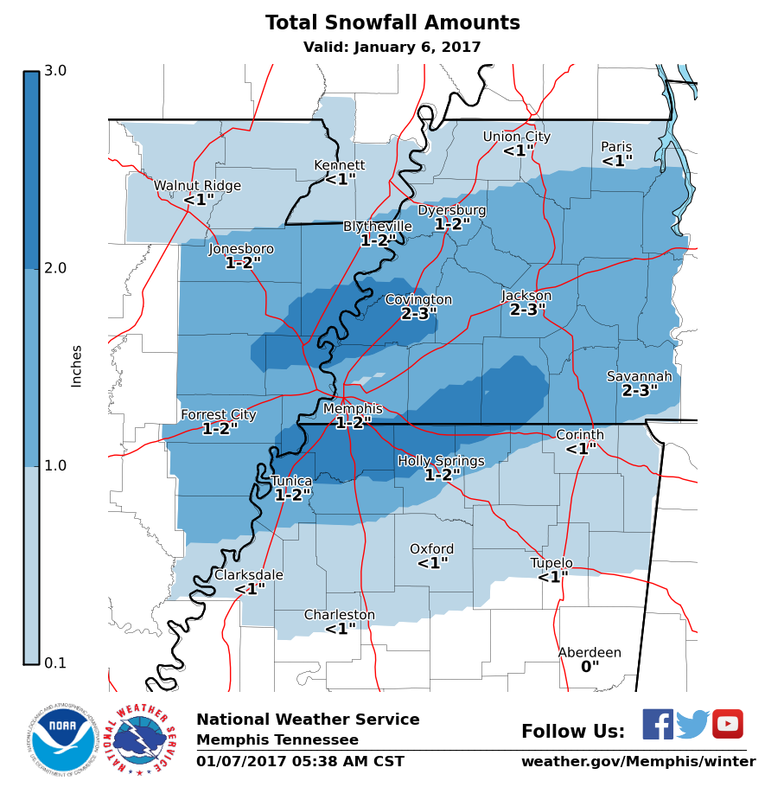 Snowfall officially totaled 2.0" at the airport with reports across the metro varying from just under an inch to about three inches. No severe weather was reported and only one warning was issued, a Flash Flood Warning for far southern Shelby County and far northern DeSoto County on the 10th, which also happened to be the wettest day of the month as storms trained along the TN/MS border. Comments: The average temperature of 48.5 degrees ties for 8th warmest January on record. Seven days recorded sub-freezing low temperatures, which is 7.5 below the long-term average. Comments: All snowfall occurred on a single day, January 6th.